Our tribute to North Carolina’s 38,000 miles of wild and scenic rivers, from the Appalachian mountains to the Atlantic Ocean. 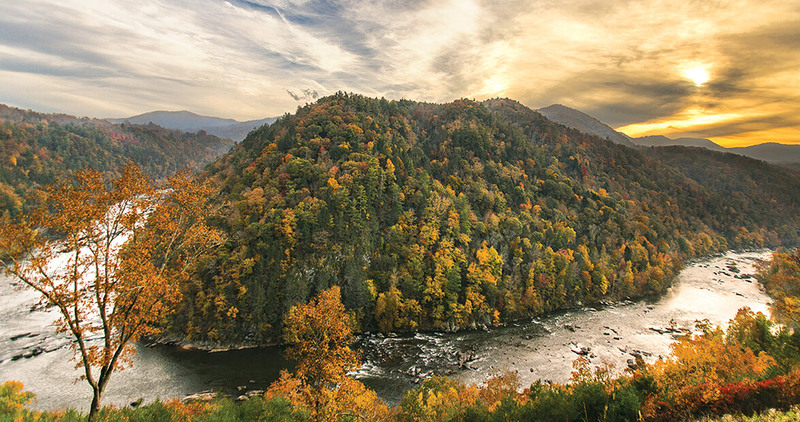 Above: The French Broad River winds through more than 210 miles of the Appalachian Mountains — from Transylvania County to Madison County and the Tennessee state line — including this scenic bend near Marshall. Trickle to torrent, down mountainsides and through valleys, North Carolina’s rivers braid our state, plait our places together. Without rivers — our vast and interconnecting network of free-flowing waters to the sounds and sea, to lakes and reservoirs — we’d be lost. We’d be thirsty, hungry, dirty, grounded, landlocked. Our crops would wither; our industries would fail. Our memories would suffer; our history would change. The Tar, the Eno, the Dan. We are bound to them and bound by them. Before the first rutted road, there were rivers. They guided settlers, became outposts, determined where our towns would be — gristmills and lumber mills and grazing lands and corn fields. Rivers were landmarks on the earliest maps. They carried crops and china, armchairs and armaments. Books, bonnets, food. Soldiers. Families. Our rivers are the stuff of stories and songs, novels and poems, odes and essays, hymns and psalms, legends and fairy tales. “Shall We Gather at the River.” “Ol’ Man River.” Thomas Wolfe’s Of Time and the River. The Neuse, the Deep, the Tuckasegee. They claim us from our first toddling footsteps into a current, wading into the wet, the feel of water — warm or frigid — flowing beneath an instep, around a shin, up a goose-pimpled forearm. They own us from that first teeter on a moss-slippery rock, that first cautious lifting of a stone to glimpse a scuttling salamander or crawfish. A few years later, they laugh with us as we try, with sticks and stones, to dam them. Later still, they capture us with that first cast into a shaded pool, that first dip of a paddle or ski or inner-tube float. They cool our foreheads and our sodas and our Chardonnay; they douse our campfires and fill our canteens and sing us to sleep without ever uttering a word. The Brunswick, the Mayo, the North Toe. Before there were swimming pools shocked clean with chlorine, there were swimming holes made by rivers. Before carved fonts in churches, local rivers stood in for the River Jordan at baptisms, when the sins of the world washed away like a floating feather, and left behind a cleansed rebirth into a new life. The Pee Dee, the Pamlico, the Roanoke. A river is a living thing. It grows and swells, thins and widens and ages, not unlike a human being. The human body is, in fact, composed of 55 to 75 percent water. Is it any wonder, then, that we feel so connected, so drawn to rivers? Like a human being, a river resists constraints, and finds a route around or over obstacles. We, too, will carve new paths, take on new identities — sometimes angry, occasionally passive, often friendly. You can bridge a river, or ford it, or ferry across it, but you cannot pin it down or wholly define it. What fisherman, what canoer, what waterfall chaser, what hiker, hasn’t believed himself the first to discover a secret, shaded fishing spot, an unnavigable chute, a frothing cascade, a secluded swimming hole? Our rivers are narrow enough to wade across in mere steps, and wide enough to sail over in elegant, masted ships. 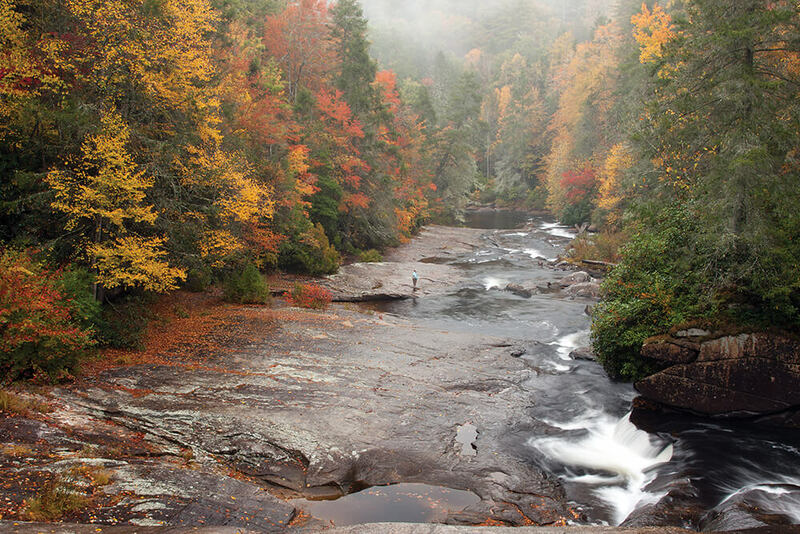 The Chowan, the Nantahala, the Watauga. Like us, rivers have moods: secretive, minding their own business, cloaked in mist on foggy fall mornings. In winter, they withdraw — though never hibernate — muted by ice, waiting for the thaw. Come the fresh days of spring, and the long days of summer sunlight, they’re open, welcoming, inviting us to play with them, in them. Lazily meandering Down East, or tumbling down Appalachian heights, they share their gifts of fish, a water-smoothed stone, riverbanks covered in wildflowers, dragonflies, a tiny nugget of gold. And yes, the occasional alligator or water moccasin. Because if a river is a living thing, it’s also a wild thing, for wild things. The Black, the Green, the North, the South. How many states can claim rivers that flow to both the Atlantic Ocean and the Gulf of Mexico? Head west on I-40 toward Black Mountain and Asheville, crest the winding miles of highway, spy the small “Eastern Continental Divide” sign on the right, and know: At this very spot, our rivers begin to flow southerly, rather than easterly. The concept itself is hard to grasp; the fact of it, remarkable. The Broad, the Cane, the Cashie. You need nothing to enjoy a river. Oh, there are toys, sure — fancy fly rods and high-tech kayaks and complicated cameras — but a river provides pleasure free of charge, asking only that you enjoy its journey, and take from it what you may, from adventure to peace. They provide, yet ask for nothing. And just as it is our privilege to enjoy and utilize them, it’s also our duty to preserve and protect our state’s rivers, mighty to minor. The Smith, the Scuppernong, the Swannanoa, and so many miles of others. Forever may they flow.